If you have a sweet tooth like I do, then I’m really excited to introduce you to the sweetest place on earth: Turkey. Ok, so this might not be perfectly accurate since I haven’t traveled every country, but I can tell you that after 28 years and 20+ countries visited, Turkey has the most amazing desserts I’ve ever tried. Turkey is sandwiched between Asia and Europe, so it has a lot of culture influencing their desserts. And it doesn’t matter what time of day it is, or if your a female, male, or a child — any time is a good time to enjoy a Turkish coffee or “cay” (tea) with an accompanying Turkish dessert. 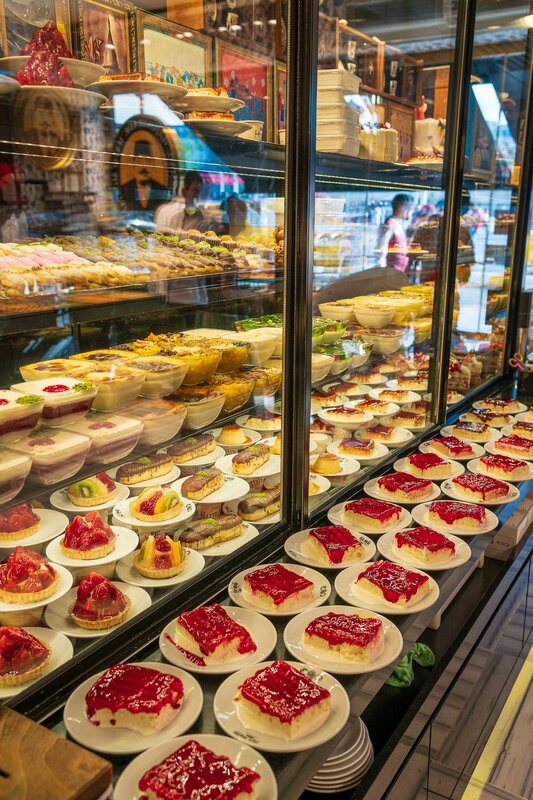 In Istanbul in particular, there are sweet shops in pretty much every corner, with succulent showcases that will make it impossible for you not to stop and want to try everything. 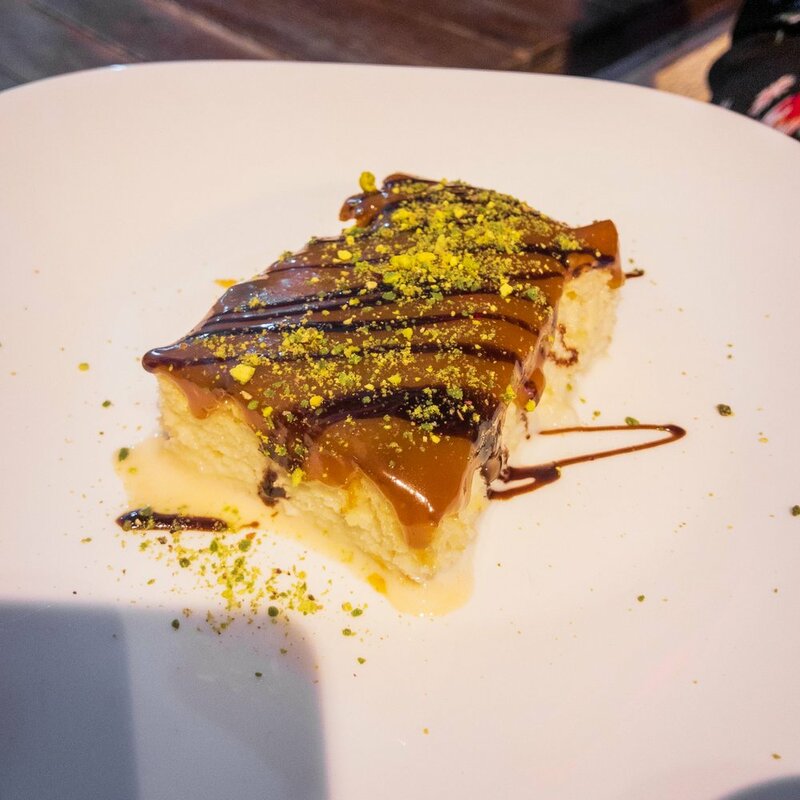 One of the most popular places to visit is “Hafiz Mustafa,” a really nice chain of restaurants offering an enormous menu that only has desserts: a “fancy” yet affordable cafe. Although, after spending 2 weeks in the city, we ended up realizing that if you visit smaller shops in less touristy areas, you pay 3 to 4 times less than you do in the big chain restaurants/shops, especially for baklava and other Turkish delights you buy by the kilogram. This is the KING of the Middle East and Balkans area. Baklava is a pastry made with layers of “filo,” filled with nuts and then bathed in syrup or honey. Robert introduced me to baklava a couple of years ago (thank you! ); he was a lucky boy to have grown up eating this dessert at home because of his Lebanese grandfather’s influence on what his mother ended up cooking at home. Several of the countries we’ve visited serve baklava, but we’ve never seen it (and had it) in so many variations: filled with walnuts or pistachios, topped with hazelnut or chocolate, cut into squares or triangles or giant cylinders — the list goes on. This country is just the best for baklava (at least that we’ve tried so far) and it is an absolute paradise for your taste buds. And what’s best is that while baklava ends up being considerably more expensive in western countries, it is extremely inexpensive in the Balkans… so enjoy as much of it as you like! First of all, “dondurma” is Turkish ice-cream, their variation of ice cream, but much creamier. So then what are they mixing with ice cream? Kadayif is a really sweet and crispy dessert made with strings of dough and normally filled with some kind of nut (typically walnut or pistachio). After baking it all, they cover it with a sugar syrup that gives it its sweet flavor. The first time we tried Kadayif, it was filled with pistachios and topped with a scoop of melting ice cream. And after trying it like that, I wouldn't recommend having it any other way: the combination that this sweet dessert and ice cream create is heaven. Künefe seemed like the “go-to” dessert for everyone visiting sweet shops. It is essentially unsalted cheese wrapped in shredded Kadayif (those strings of dough we just mentioned), and then all soaked in syrup. This is the perfect combination for those of you who love cheese and sweets — a bowl of hot, melting cheese with savory sweetness through every bite. Not our photo. After eating more Sutlaç than I’d like to admit, we never took a picture! Sutlaç is the Turkish version of rice pudding. I know, it’s probably the least appetizing on this list at first sight — but it completely surprised us and immediately made it to my top 3 as soon as it hit my lips. This rice pudding has a more gelatinous texture than any milk-based rice pudding I’ve ever tried before along with a nice touch of vanilla pulling it all together. Also, it’s topped with a caramelized layer that brings to mind a creme brulee: the layer is created by putting the rice pudding in the oven, taking it out, and then burning the top for a few minutes with a torch. Sutlaç — a classic taken to the next level. Künefe is typically topped with a bit of pistachio powder, a nut that, as you’ve probably noticed by now, is present in a lot of Turkish desserts and gives them all a really nice salty touch. Just like Kadayif, Künefe can be also served with Turkish ice cream (and practically any dessert tastes better with ice cream). Trileçe is another remix of something we already know: Tres Leches, a Latin American dessert that we enjoyed in Miami. The main difference for the Turkish version is that they don’t use condensed milk, which results in a softer texture that’s less dense. Turkish Trileçe is a soft, spongy cake steeped in sweetened milk and usually coated with a layer of caramel or strawberry jam over top. Trileçe is also easy to find in other Balkan countries, and I find that every time I try a new one, it’s slightly different but just as delicious. If you're in Turkey and you happen that you visit Kaş, you have to visit a small sweet shop/cafe called “Tatlı Dükkanı Kaş Şubesi,” (in the photo), as they have one of the BEST trileces in the world. Lokum, or Turkish delights, are the perfect companion to a Turkish coffee or tea. 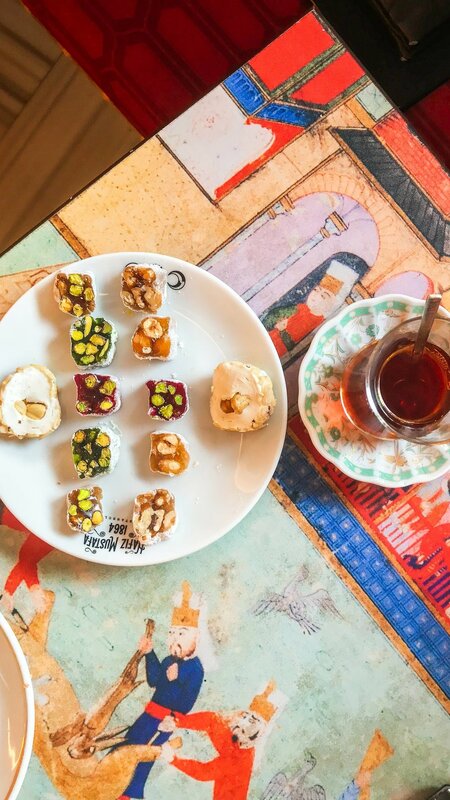 Turkish delights are sweet-smelling, gelatinous cubes, commonly flavored with citrus, rosewater, or syrup, and then filled with different ingredients/nuts, like pistachio, hazelnuts, or walnuts. This dessert, just like Baklava, is also sold by the kilogram, but when you order a coffee, you usually get a complimentary piece of lokum. The best way to try different types is going to a big place like Hafiz Mustafa where you mix-and-match them when ordering. Then, you can go and buy a kilogram or two of the one you like best! So, there’s only one thing left to know: what are your favorite desserts?